I spent the day planting Iris in the garden yesterday. It was a completely glorious day. The sun was out, and maybe just a tad bit too hot. After the late unexpected freezes, we are all pleased to finally have warm weather……even the flowers are happy. Yesterday, I noticed that Mema’s pale yellow Iris are finally blooming. I have been waiting to see where the Iris would pop up. Being the unorganized gardener that I am, I had been worried that I had misplaced the Iris, or that I had accidentally given them away. After 4 months of nice garden digs, all tubs of Iris begin to look the same. I was relieved to know Mema’s Heirloom Iris are safe and sound, blooming beautifully, and NOT mixed up with the Cemetary Iris. Mema’s Iris is a unique shade of a pale, two-toned yellow. It is a true heirloom in every sense of the word. The Iris was given to me by my husband’s uncle, who dug them up from Mema’s house. The beautiful yellow Iris had been there since the 40’s. Mema told me that she and her friend traded Iris, which is how her “passalong plant” came to reside in her garden. I had always loved the unique shade of Mema’s Iris. To this day, I have never seen another variety like it. Heirloom Iris are vigorous growers. The strappy foliage is dark green. I often use Iris to line my garden beds. Iris are an excellent weed barrier and natural garden divider. I’m actually in the process of taking up old cedar edging, and lining the Oxblood Lily beds with Iris. The exasperation of getting the hose all tangled up as I drag it through the cedar edging was enough to ruin even the best of days. Iris to the rescue!!!!! 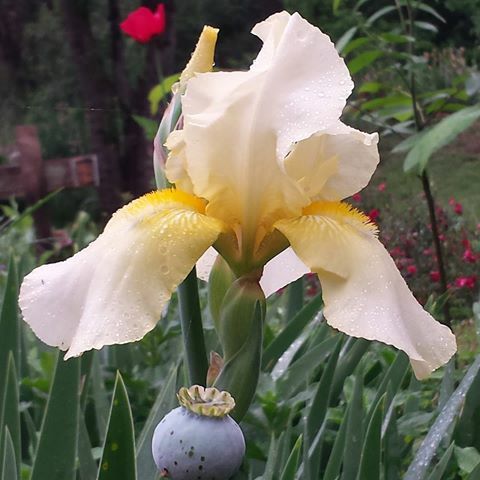 I will have Mema’s Heirloom Iris available again in the Fall. The Iris are settling into their new home, and putting roots down…. literally and figuratively.